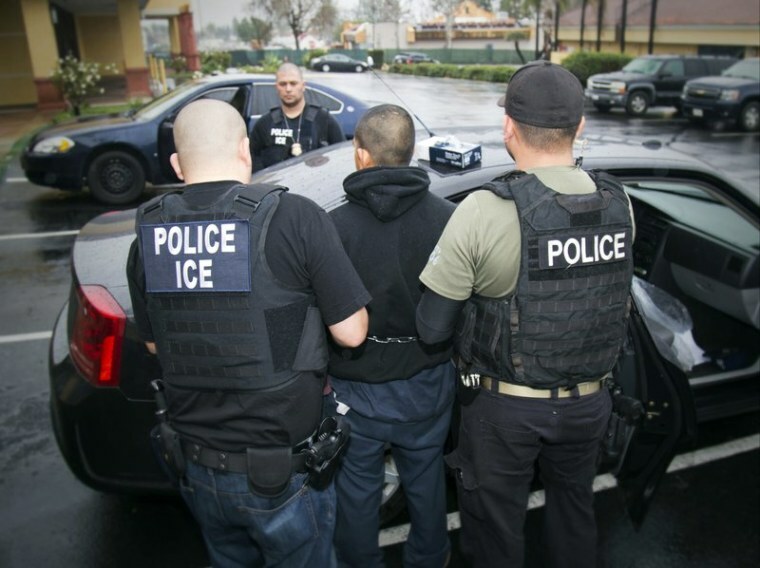 Arrests of non-criminal immigrants nearly tripled, according to figures from the U.S. Immigration and Customs Enforcement. SAN DIEGO — People arrested by deportation officers increasingly have no criminal backgrounds, according to figures released Friday, reflecting the Trump administration’s commitment to cast a wider net. U.S. Immigration and Customs Enforcement said 65 percent of arrests from October to December were criminals, compared to 82 percent during the final full three months of the Obama administration. Looked at another way, arrests of criminals jumped 14 percent to 25,626 from 22,484, but arrests of non-criminals nearly tripled to 13,548 from 4,918. Overall, there were 39,174 deportation arrests from October to December, up from 27,402 during the final full three months of the Obama administration. The 43 percent surge is consistent with trends since Trump took office and dramatically increased enforcement. During the 2017 fiscal year, which included nearly four months under Obama, 74 percent had criminal convictions and an additional 16 percent had pending charges, according to ICE. The most common crimes were driving under the influence, drugs, other traffic offenses and immigration violations. The administration has said people with criminal histories remain a priority but that no one in the country illegally is immune. Many with deep, longstanding ties in the country who stayed out of trouble were allowed to stay under Obama but are now ordered to leave. In February, former Homeland Security Secretary John Kelly, now Trump’s chief of staff, scrapped the Obama administration’s policy of limiting deportations to people who pose a public safety threat, convicted criminals and those who have crossed the border recently, effectively making anyone in the country illegally vulnerable. ICE’s Dallas field office tallied the most arrests during the latest three-month period, followed by Atlanta and Houston.